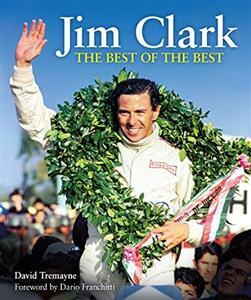 Jim Clark was a genuine sporting hero. He won 25 of his 72 Grands Prix and in the sixties was the yardstick by which every other driver on the starting grid was judged. Quite simply, Clark was peerless. Stubborn and notoriously indecisive outside the car, where he would nervously chew his fingernails, he was a genius when he got behind the wheel. To many he remains the greatest racing driver of all time, not just because of his fearsome strike rate and the magnitude and manner of his achievements, but also because he remained humble and unspoiled throughout. Published on the 50th anniversary of Clark's death, this book, 20 years in the making, is a deeply detailed look at a complex and compelling character. Starting in a friend's cars in driving tests, sprints, hill climbs, autocrosses and rallies, Clark graduated to sports cars in his native Scotland while still pursuing his other passion, which was farming. Such was his subliminal driving talent that motorsport overcame farming, and he went on to win in sports cars, touring cars, Formula Junior, Formula 2 and Formula 1, and to triumph in the legendary Indianapolis 500 in America. Clark's Formula 1 debut came in 1960, with Team Lotus, where his unique fraternal relationship with boss Colin Chapman became one of the cornerstones of success for them both. Driving for Lotus throughout his professional career, Clark was twice a World Champion, in 1963 and 1965, famously winning seven of ten rounds on the way to his first crown. On his first visit to the Indianapolis 500, in 1963, he finished second, and two years later he became the first Formula 1 star to win it, with his Lotus the first rear-engine victor as well. Clark's tragic death, in an unimportant Formula 2 race at Hockenheim in Germany on 7 April 1968, was likened by compatriot Jackie Stewart to motorsport's equivalent of the atomic bomb. A special feature of this book is the personal insight from the author's dozens of interviews with family, friends, drivers and mechanics.